I only meant to peruse this book but ending up reading it in one sitting like a bag of chips… just one more, etc., until the bag was empty. It was a beautiful few hours. 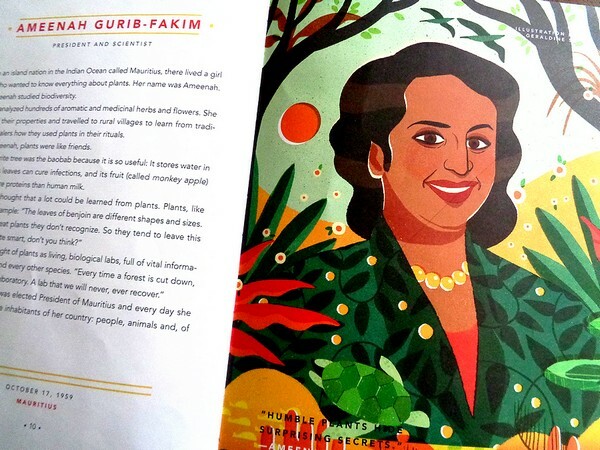 100 bite-sized entries (a single large print page each) of 100 women known and unknown, all of whom have contributed extraordinarily to all aspects of society. 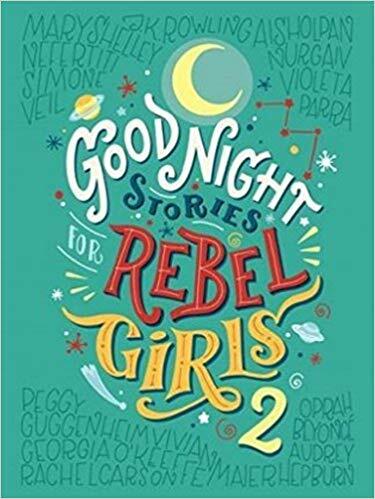 Intended for children, it’s really a quite marvellous read for all ages, a kind of SparkNotes for anyone who’d like to be introduced to highly influential women of history (and present times), most of whom you’ve never heard of. 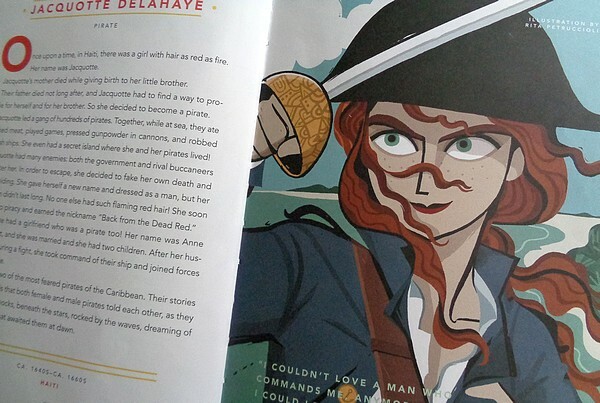 And then there’s the art… beautifully coloured illustrations… one for each ‘bio’, each by various female artists from around the world. 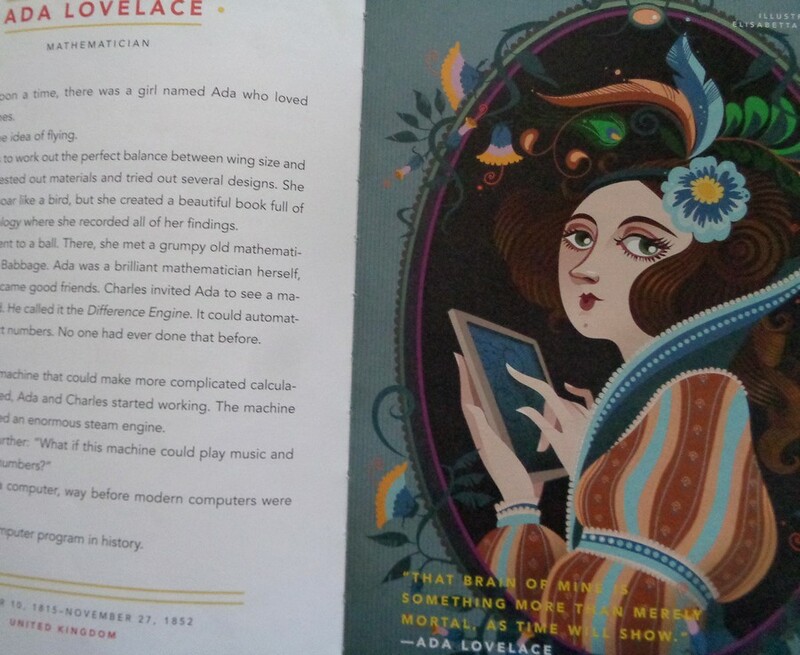 In the Preface, co-authors Elena Favilli and Francesca Cavallo write “…trust is not something women get to experience very often… “ They’re referring in part to the women in the book who “…No matter the importance of their discoveries, the audacity of their adventures, the width of their genius… were constantly belittled, forgotten, in some cases almost erased from history,” but this reference of trust is also for the ‘now’, in its acknowledgement of the overwhelming response to monies raised through crowd-funding in order to publish the book, people (from over 70 countries) who trusted and believed that a book like this was necessary. While each ‘story’ begins differently, they all have their own tone. I love Ada’s for its tra la opening, all birdies and the fanciful idea of flight, followed by that big tekkie punch of an ending. And so it goes, each double page spread a whole new person and their world. 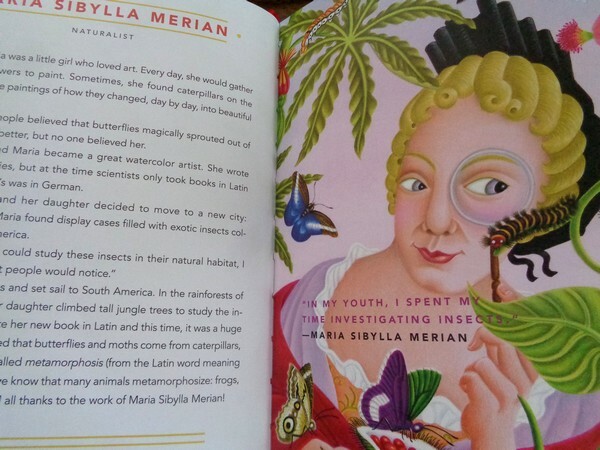 Among the stories featured, a cyclist (who broke records but was ultimately forbidden from competing because she was a woman), a blind ballerina who went on to found the National Ballet of Cuba, the President of Mauritius (who is also a Scientist devoted to the environment), the 22 year old Canadian inventor of a flashlight that’s powered by body heat (and which won first prize at the Google Science Fair), a Russian journalist who risked her life to expose the truth about Chechnya, an Italian woman who is today considered one of the greatest painters of all time. 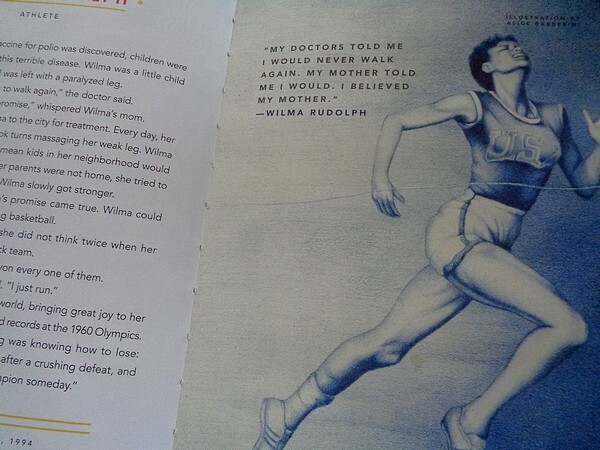 And how lovely to meet Astrid Lindgren (Pippi Longstocking), and Catherine the Great who did great things in Russia (including having her creepy husband Peter imprisoned, and Bolivian skirt-wearing mountaineers, Cleopatra (I didn’t know how powerful she was or that she was the last pharaoh to rule Egypt…. given how the focus on her, historically, has been her looks and that stupid asp; in fact her motto was “I will not be triumphed over.”). 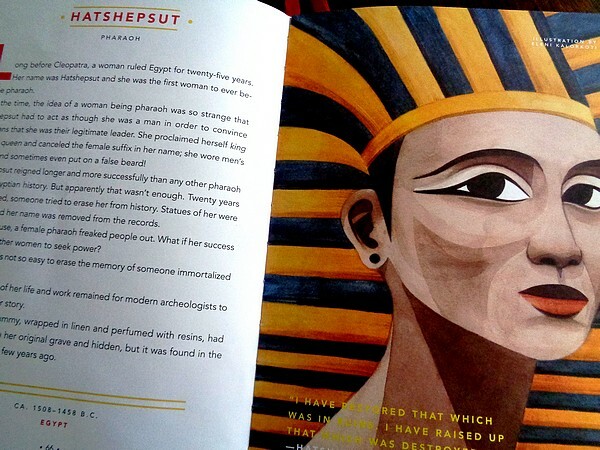 And then there’s Hatshepsut, another Egyptian pharoah. Huh, imagine. And Coco Chanel and Cora Coralina, a beloved Brazlian poet and baker, and Elizabeth I who was locked in the Tower of London by her rotten sister Mary and who, when Mary died, became Queen and created a merry court of music, poetry, painting and theatre, a great admirer of Shakespeare. She was a very good Queen. The book is alphabetical and I’m only at the E’s so, really, I shouldn’t go on, except that I will because from E to Z there are activists, politicians, Florence Nightingale, Frida Kahlo, computer scientists (one of whom was crucial to the success of the moon landing in 1969), a couple of pirates and a sailor, Harriet Tubman, Helen Keller, war heroes, writers and astronomers, Jane Goodall, Empress Jingu of Japan who successfully led an army and who people assumed had magical powers because otherwise how could a woman successfully lead an army?, Joan Jett, Julia Child. A nice touch is the very last double page spread, which is blank for the reader’s own story and self portrait. This is a book for every girl. Also a web site which feels a little like a happy Revolution.. 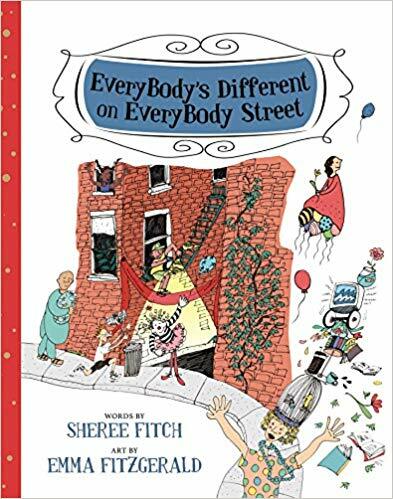 This morning I made a pot of lemon verbena/peppermint/orange mint tea with leaves from my garden and read Sheree Fitch and Emma Fitzgerald’s extraordinary Everybody’s Different on Everybody Street..
Is there a better way to start the day than tea and a (picture) book? And as I read I could feel emotions rising as the everbodyness contained in Fitch’s buoyant poetry practically floated off the pages. 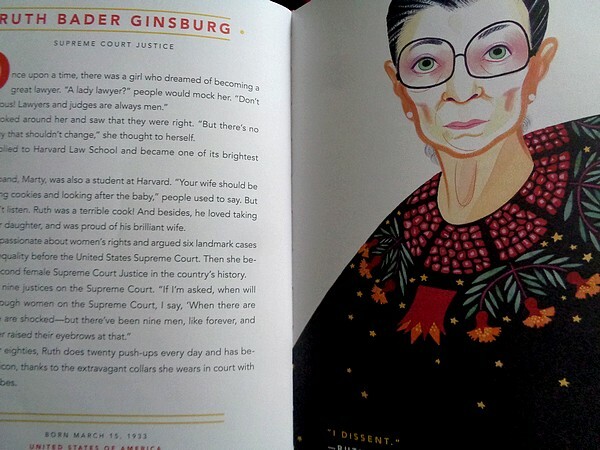 This book is a testament to community, and to joy. It’s also about mental health/illness in its many forms. And to be honest, the power of it kind of takes you by surprise. Oh but we are in such good hands here because, as only Fitch can do, we are gently (playfully!) shown that all those people who look and act ‘differently’, who for whatever reason fall outside the punishing parameters of what society calls ‘normal’… are simply displaying aspects of being human that we all share. The very young will only see peacocks and happy chaos… in the way of the very young, who don’t judge. But the message of inclusivity is there, the subliminal suggestion of non-judgement and, for those old enough to understand or who, in the company of a reader sensitive enough to explain, it becomes a thing to celebrate, to embrace, the beginning of meaningful conversation. I look forward to sharing this with my eight year old niece. We will eat french fries at the beach while we read and we will talk about how we feel some of these feelings some of the time and we’ll notice people around us and make up lives for them… and remind ourselves that they have feelings too. And what an important one. I got my copy at Blue Heron Books, and you can too! 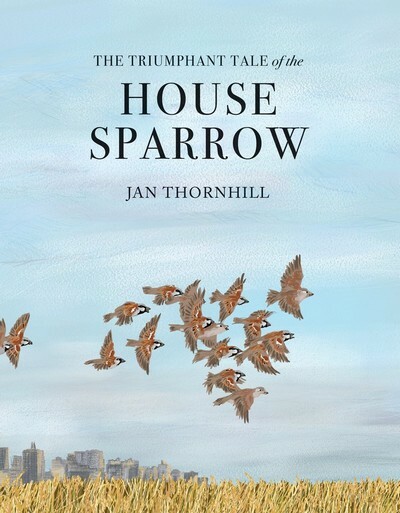 I was surprised and delighted by the adulty appeal of Jan Thornhilll’s The Triumphant Tale of the House Sparrow … technically a picture book (with wonderful illustrations) but the kind that bears reading by all ages for a sort of Coles Notes (do they still exist?) version of a subject that can then be pursued in longer form if you need/want more info. Though, honestly, there’s plenty here, enough that after reading it will surely be impossible to look at this bird quite the same way. … we can (rightly) assume there will be some adventurous backstory to follow, i.e. how did it get from Most Despised to Triumphant? But no. It’s much bigger than that and, most interesting of all, their dislikeability has a lot to do with us, with our lifestyle. Because what we know for sure is they love to hang around us, like those friends who think we’re all having such a good time that they forget to go home. What happened was, we invented agriculture. We began growing fields of grain and the sparrow, a bird that used to migrate in search of food, suddenly didn’t need to leave town so it stayed and ate that nicely planted all you can eat buffet. It came into cities and towns too, because we had horses that were fed buckets of grain. And it hung around our houses because of crumbs from tablecloths shaken out the back door, and several other surprising sources. Long story short, it became a house sparrow. In Germany there was a sparrow bounty, a required number of heads had to be handed in or fines were imposed. In China people were encouraged to bang pots twenty four hours a day in grain fields to stop the birds from landing, which worked exceptionally well… so well in fact that zillions of birds fell from the sky, exhausted and dead, and the crops died from an infestation of bugs that would have normally been eaten by the sparrows. I think this book, generally, deserves all kinds of attention, not only as it relates to house sparrows, but what it represents in how we so often look at nature, what’s taken for granted, the problems we ourselves have created and now blame on the natural world, much of which is merely doing its best to tolerate us. 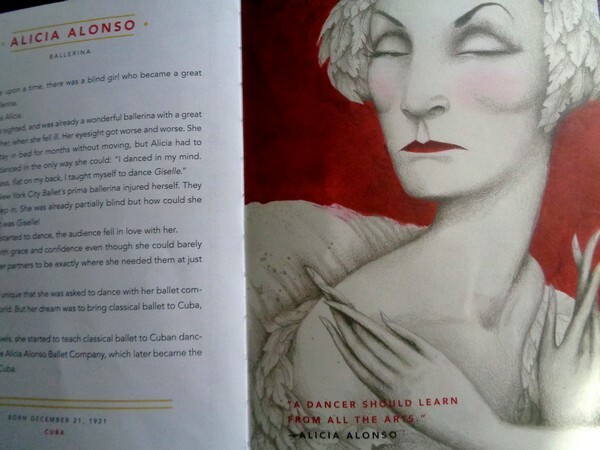 The picture book format works well because the amount of text is just right for that Coles Notes gleaning. Any less wouldn’t do the subject justice. But it’s also too much for a picture-book age child to absorb on their own, so it becomes ideal as a read-aloud-and-discuss. Followed, of course, by a sparrow finding expedition, photographs, drawings, and chirping! Purchased at Books Galore, in Port Perry. 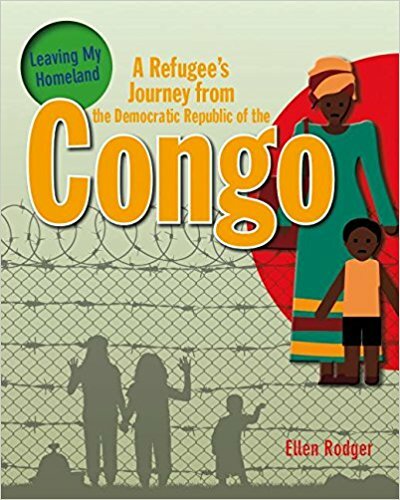 Kudos to Crabtree Publishing for their new ‘Leaving My Homeland’ series of picture book style books focusing on the refugee experience from the perspective of children. 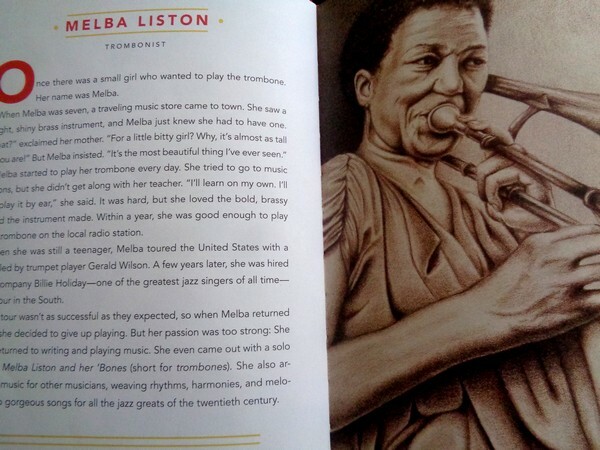 Each of the books covers one child’s story. Simple things explained, like the difference between refugees, immigrants and IDP’s (internationally displaced persons). 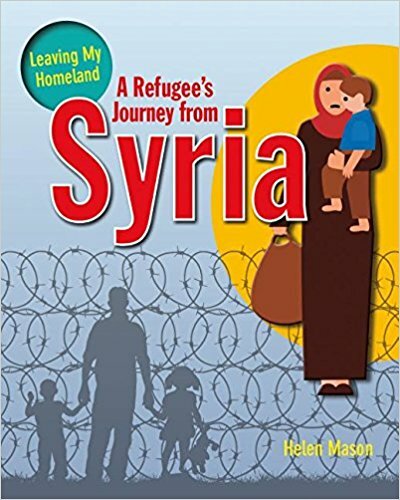 There are stories of journeys by boat, by air, and those on foot and how each of these journeys feels, the refugee camps they live in, sometimes for years, the people that help along the way and those who betray. 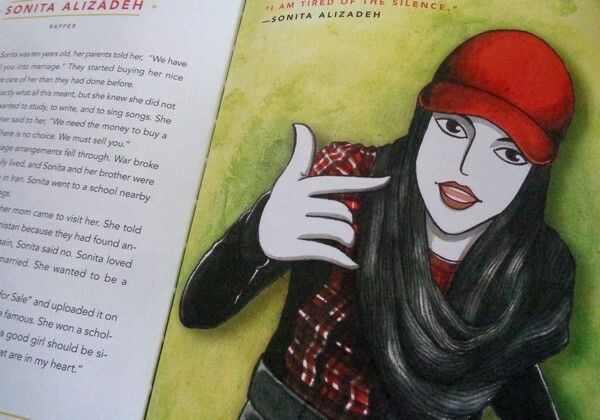 I especially love that these books for children don’t shy away from talk about Islamaphobia and why some people might be afraid of Muslims. They straighten out misconceptions and show children from these countries as simply children. All of the stories are extraordinary to imagine, but despite the subject matter there is, amazingly, no drama. The books are not intended to shock or create sympathy, but merely to create a level of understanding of The Other. 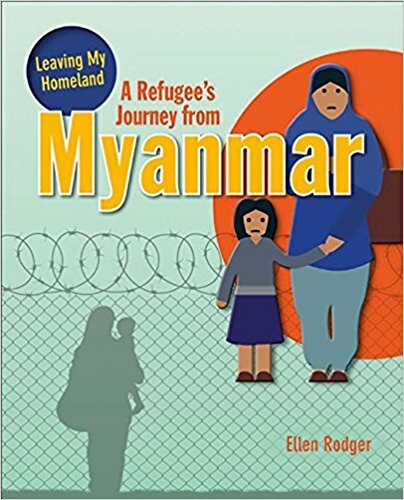 For example, in A Refugee’s Journey from Myanmar, by Ellen Rodger, the complicated history and present situation facing the Rohingyas is explained in simple and clear language that not only informs but will, hopefully, lead to questions and conversation. There are stories about what happens when children go to their new schools, how they don’t fit in, don’t speak the language, but the focus is never on how that makes the child feel sad, or of being bullied or teased, though we know that happens, but instead, the mandate of the books seems to be… now that we know something of the situation these individuals have come from, the things they’re dealing with…. what can we do to help? Imagine living in a country where fear is normal. You fear government soldiers, the police, and maybe even your next-door neighbour. You might be scared of being attacked if you leave your home. That is what life is like for some people…. Each book also includes a glossary and lists of websites and other excellent reading along the same lines, like Margriet Ruurs’ Stepping Stones and many others. This is really such brilliant, welcome and necessary reading for kids, and families together. Books that matter. Can’t have too much of this. The title is a reference to the instinct for their sense (and survival) of ‘self’, the small pleasures they found in things like the colour of leaves and braiding grass into their shorn hair. 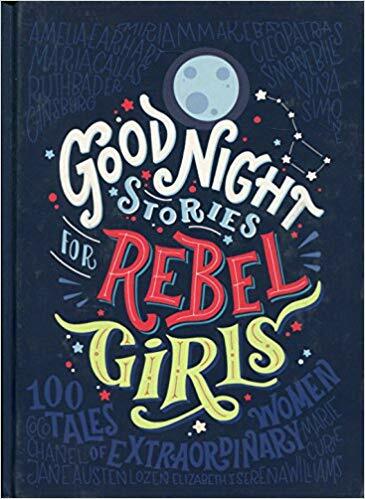 I love this book for its story of courage and strength, but also for its structure, the rhythm of the questions and answers, the repetition of certain lines, especially the reference to a school that was “far away from home”… (which surely begs the question from any young reader/listener as to why it was so far away). I love the beautiful illustrations by Julie Flett (the colour palette, all rich earth tones and vivid brights alternating with the institutional monotones of muted greys and brown). But mostly I love this book because it invites children who know nothing about the history of residential schools to ask questions of their own, and so maybe, and gently, we can begin a conversation long overdue. 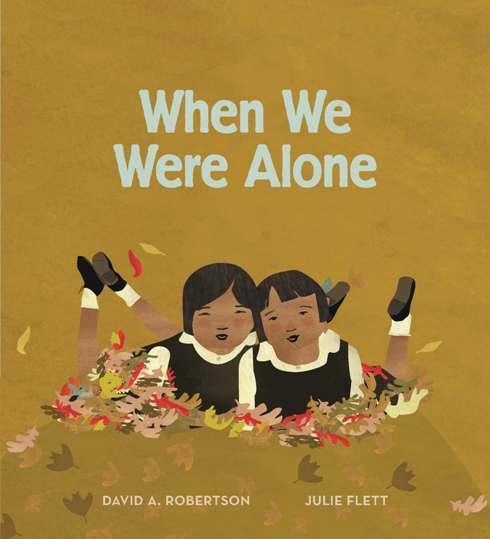 When We Were Alone can be purchased on-line from Blue Heron Books and Hunter Street Books, which I only mention because they’re two of my faves. I’ve recently set out on a quest for trashy reading and have been happily led to what appears to be not only a most wonderful book on the subject of litter but to a whole line of (very smart) books being published by Smart Apple Media, primarily for schools as far as I can make out, but they’re such excellent things it would be a shame not to flaunt them more broadly. And with that perfectly passive aggressive irony, we enter the book by addressing a few facts about ourselves and how much we throw away every year (about five pounds per person EVERY DAY). That *you*, personally, don’t throw that much away doesn’t matter. It’s not a problem that’s searching for someone to blame. It’s a problem that requires everyone to take responsibility. At least everyone who lives on the planet. The pages, 32 of them, are beautifully laid out and not crowded with information in the way this style of book can sometimes be. Nor is its intention to scold or even shock. Rather, it seems only to want to remind us of the consequences of litter, that something which seems so trivial and innocuous has all kinds of horrible consequences. Hedgehogs, for example, tend to get stuck in yoghurt containers because their quills make it impossible to back out. Used or tangled fishing lines are often cut and left in the water (because we’re such geniuses). And if you can’t understand how this is dangerous for birds, fish, turtles, dolphins, etc…. google fishing lines/wildlife sometime. Meanwhile, here’s a two minute story with a happy ending. And those plastic holders that six-packs come in? If you haven’t yet heard, all kinds of birds and animals, fish too, get them wrapped around their beaks, bodies or necks and die that way. If you see one laying around, please pick it up. You may save a life, and you won’t die of cooties. Oh, but if it’s germs you’re worried about, consider the gum that’s all over pavement everywhere. It costs between $2 and $3.50 PER PIECE to scrape off. Apparently no one has yet figured out a better way to remove it. Probably because all the money and brainpower is working on how to inhabit Mars (which will only remain gum free until we get there). One of the biggest problems in the matter of waste is that which comes from fast food restaurants. Our convenience is apparently nature’s problem. It’s no small potatoes what we choose to support with our dollars. When we give all the money and power to fast food places we shouldn’t be asking ourselves why standards are slipping everywhere we look. The problem is always us. It’s about the choices we make. 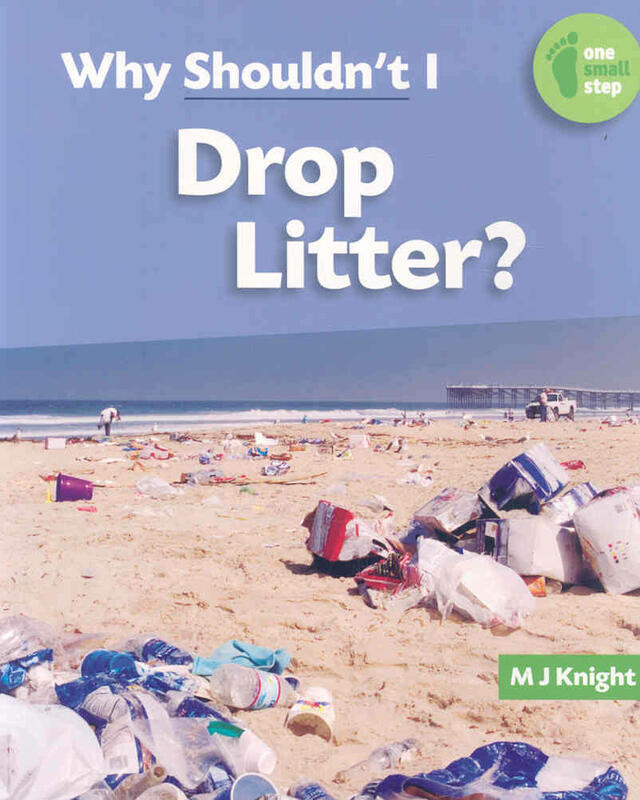 Anyway, the book is part of Smart Apple Media’s ‘One Small Step’ imprint, which seems designed to inspire engagement in our individual slivers of the world, to encourage us to understand that problems like litter are not someone else’s problem, but something we can work together to improve. I think it would make dandy reading for families that give a hoot. Also, if you come across books that deal effectively with the subject of litter, garbage, recycling, you get the idea… please let me know. I’m compiling a list for The Litter I See Project. 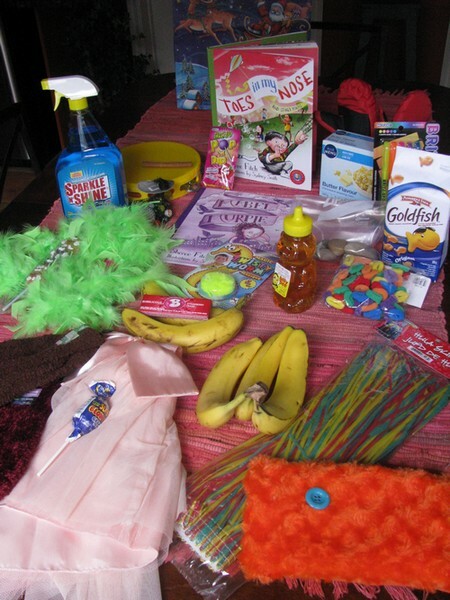 A treasure hunt bag of things that are found among the poems in Sheree Fitch’s Toes in My Nose. Also included, a ‘discovery form’ for noting which poems and which items correspond (creative interpretation encouraged so there are many options and connections… as I quickly discovered by watching a tiny mind at work—and I don’t mean mine). When completed the form may be handed in for a prize. Prize to be determined (but very likely another book… shhh).